It’s always nice to receive comments on my blog posts. For one, it lets me know that people are actually out there reading what I write. But it also allows us to open up a bit of two way communication. So when a Jez wrote “I’m about to venture into the tubeless world and am undecided whether to go for these or the Schwalbe pro one tubeless ,id be interested to hear how the Hutch is wearing?”, in response to my Hutchinson Fusion 5 tyre review, I just had to write a whole post in reply! But tyre wear might seem a little boring so I’ll bundle my latest ride into this one too.The ride planning started when I realised that I’d have a free Saturday to go riding and so I put out some feelers and most people were busy! In fact it was just Steve and I that decided that a big 100+ miler was in order. Of course this never stops me and I’d have probably gone for a solo ride if push came to shove. 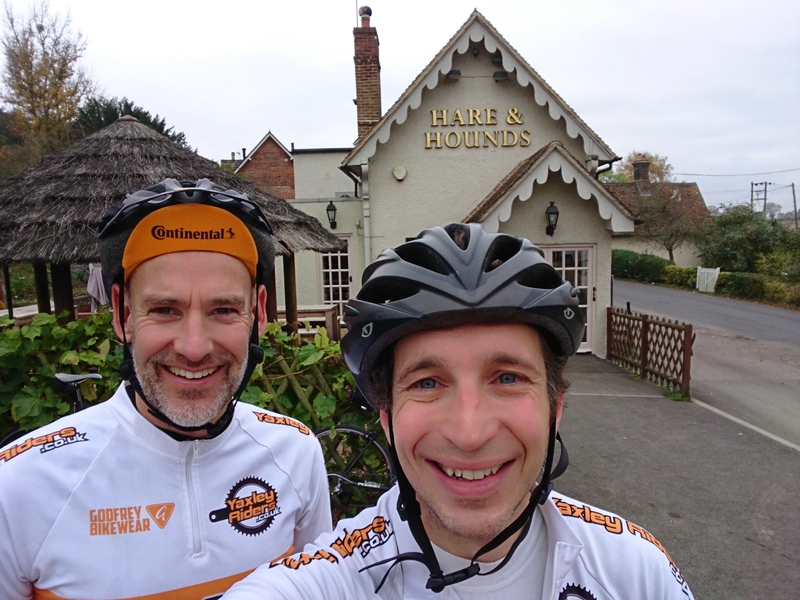 Steve suggested that he’d like to head down into Bedfordshire as these were unfamiliar roads to him; of course I work down that way and so in contrast knew lots of the roads around those parts. So a plan was hatched and I set about plotting a route. Strava routes is my planning software of choice for road riding and a little later I had a route just beyond 100 miles that took in some of the best roads in the north of Bedfordshire, set us up with a good morning coffee stop and passed through Bedford at lunchtime; to return home in time for tea, nicely ahead of dusk. With a couple of minor navigational mishaps (of the “we should have been down there! Ah, well lets go round instead” type) our day out ended up being a good 120 miles and took around 7 hours. This gives you plenty of natter time, especially when there’s only 2 of you. And so the subject of tyres did indeed come up during the ride too, giving me the opportunity to explain to Steve how the tubeless system works. I was also able to mention that since fitting the Hutchinson Fusion 5 All Seasons, I had not needed to remove either tyre at all, just needing to top up the sealant once after it recently became apparent that the pressure in the rear tyre was dropping over the course of longer rides. This of course can be done entirely through the valve and with no need to even remove the wheel from the bike. 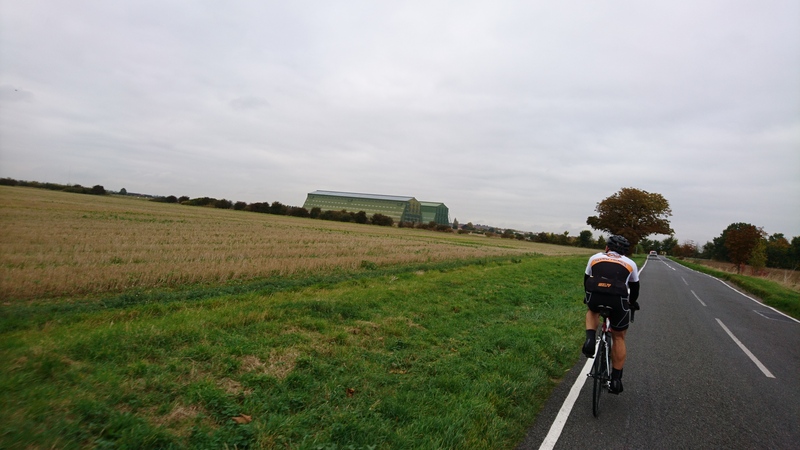 Of course conversation, although bike-rich, wasn’t entirely bike related and as we passed the huge hangers at Cardington, momentarily turned to airships! There was also the obligatory cycling day cake stop. 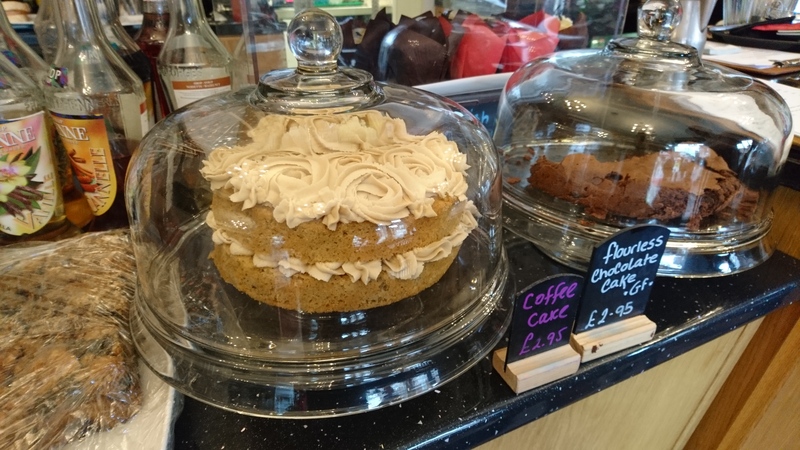 On this occasion popping into ‘The Loft’ in Shefford where upon seeing a complete untouched Coffee Cake I just had to make them cut into it and promptly ordered a slice! We sat outside at the front where we could keep our eyes on the bikes, unlocked and vulnerable as they were. 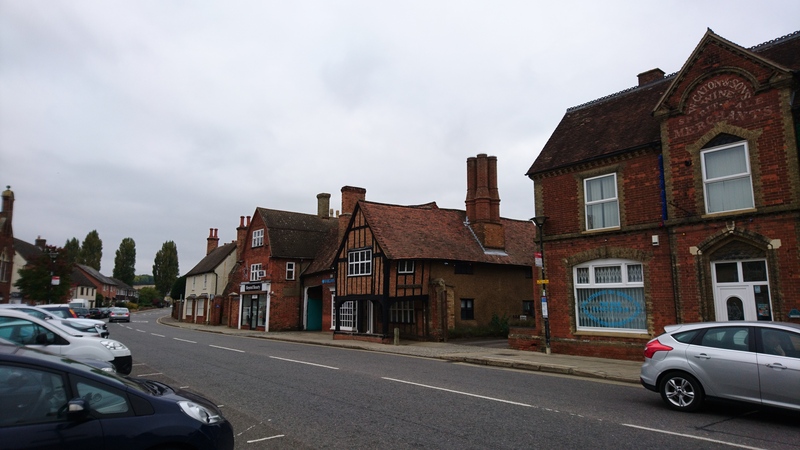 There are quite a few quaint old buildings in the little town of Shefford, the loft itself makes reference to it’s 1885 build date in the brickwork. However what caught our eye while we were sat there was the building across the road, currently home to Barclays Bank but clearly of some different original usage several hundred years previously. The large bank of chimneys protruding from the otherwise dainty roof suggesting that maybe it once housed the town’s bakery, blacksmith’s or something similar! Why the big chimney’s, may I ask? It was a good day out and a tough one too. Steve seemed to take it all in his stride (or pedal stroke) but certainly I struggled a bit toward the end, slowing more for the short climbs than I would usually do. But either way it was another 120 miles added to the wear on my Hutchinson tyres taking their total mileage now up to 1225 miles (1961 km). And to be honest during this time I hadn’t really considered how well they were or weren’t wearing. In fact I really had ignored them completely, so when I returned back home around teatime I took the opportunity to take a couple of photos of the tyres to show you, my readers! 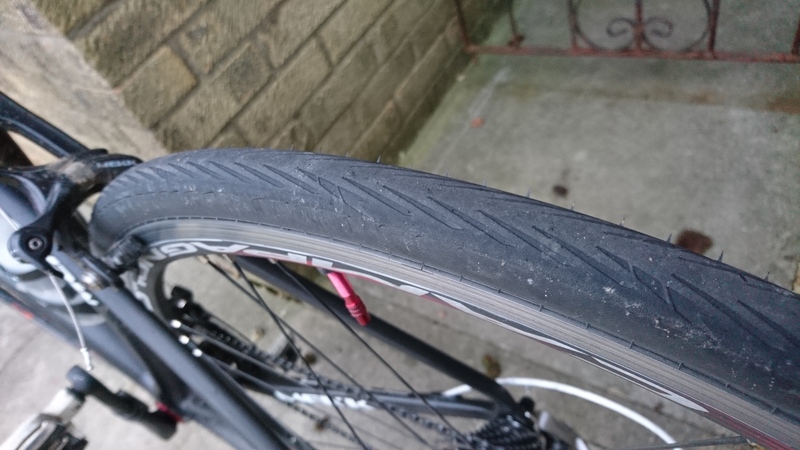 As I’m sure you can see, the wear is good, plenty of tread left, no noticeable flattening on the top and I can tell you that there are no significant splits or cuts and I’ve not had to patch it at all. The front is much the same although as you’d expect not having so much rider weight put through it the front is a little less worn. So I won’t bother uploading the photo of the front tyre. Instead I’ll finish this post with an upload of the photo I took of the Coffee Cake before it had been cut into; a much nicer photo to end with I suggest!